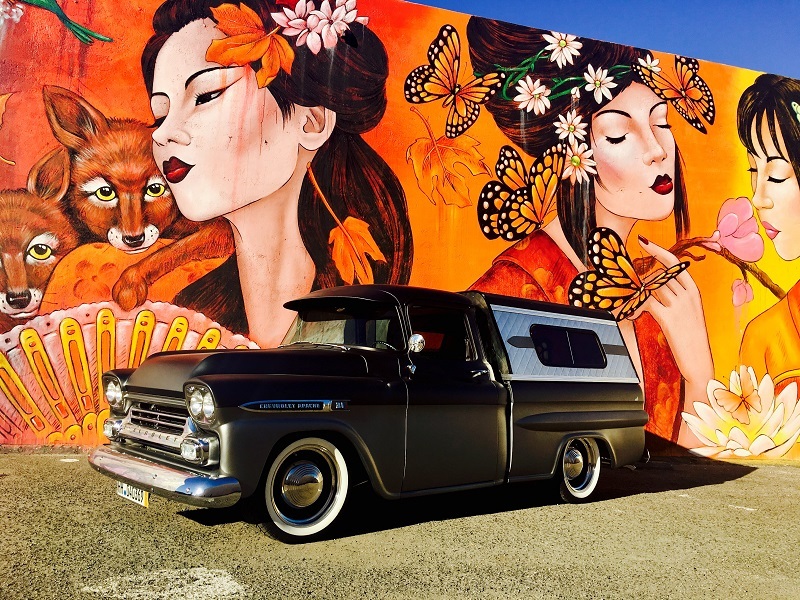 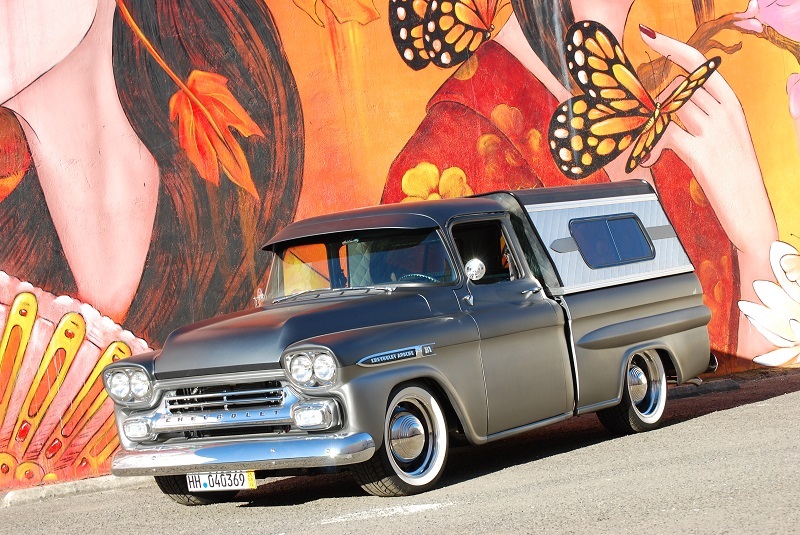 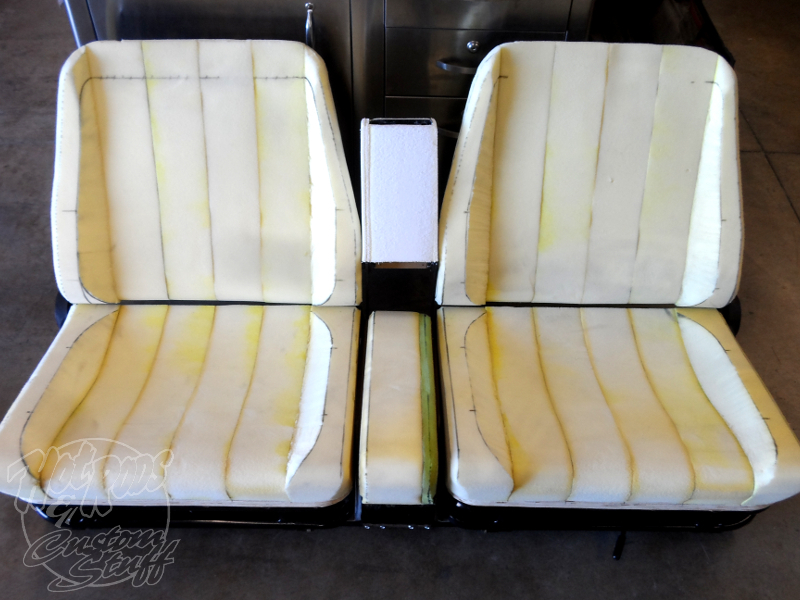 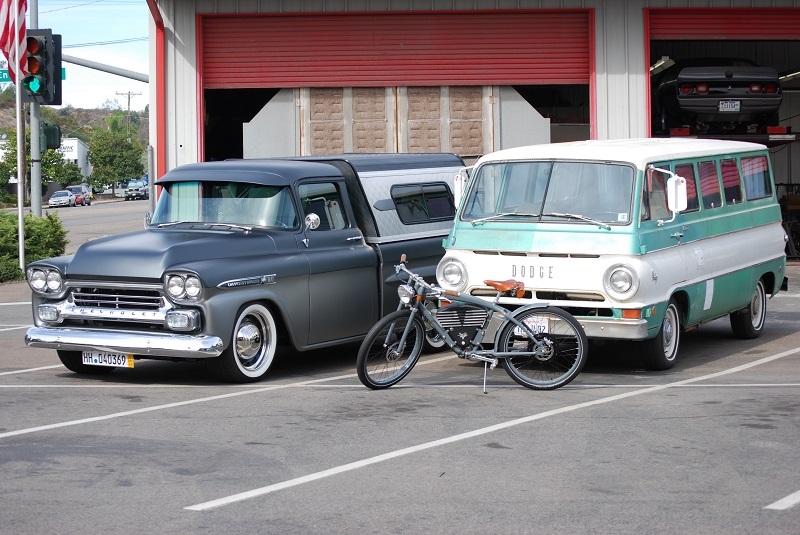 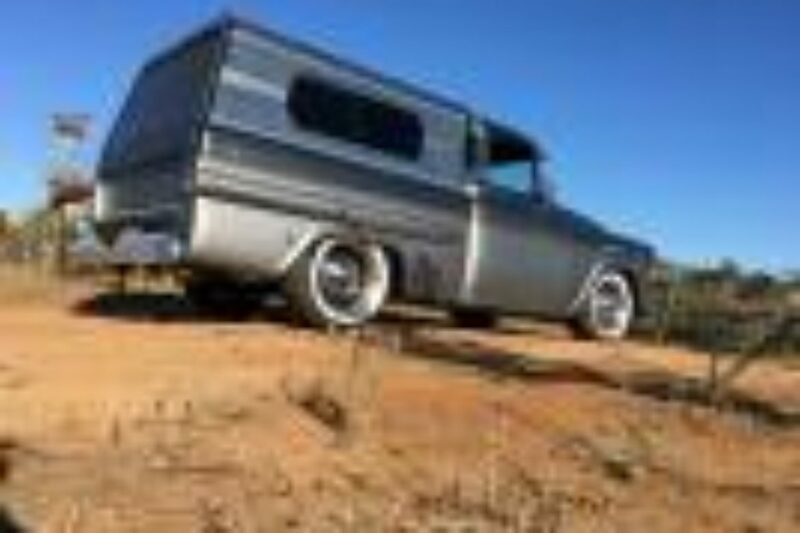 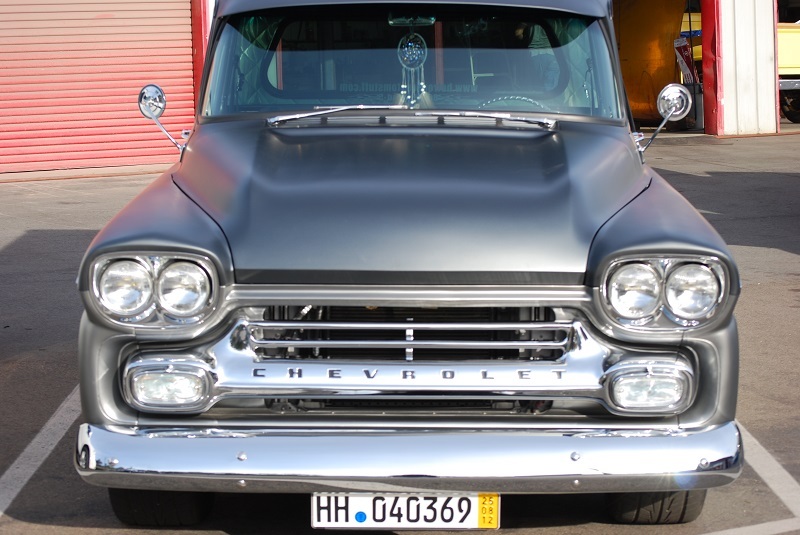 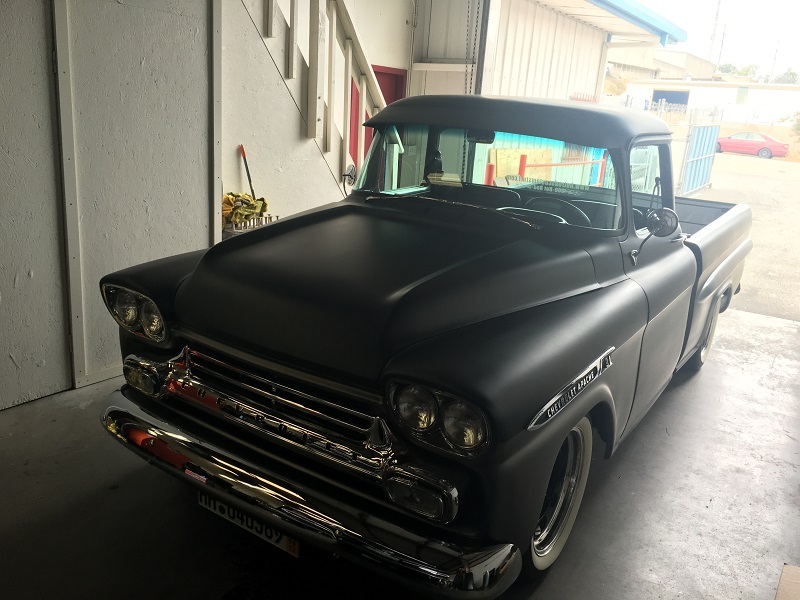 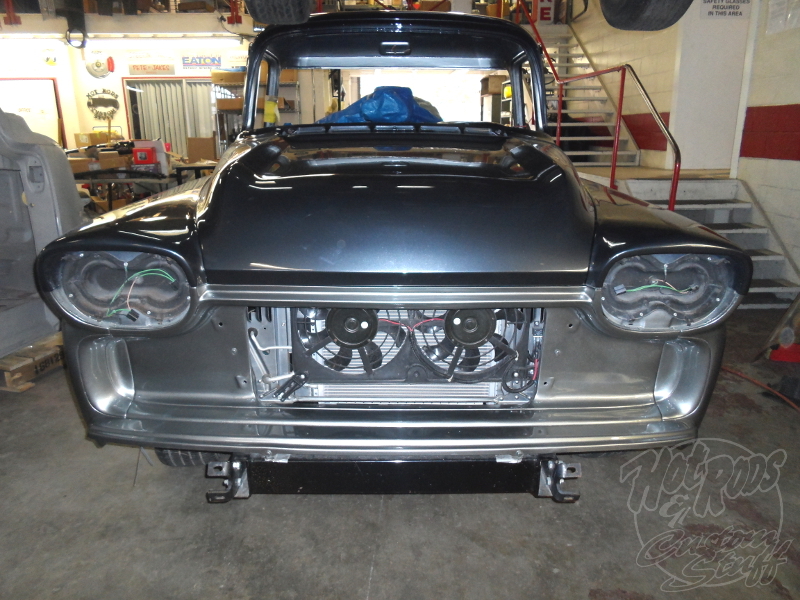 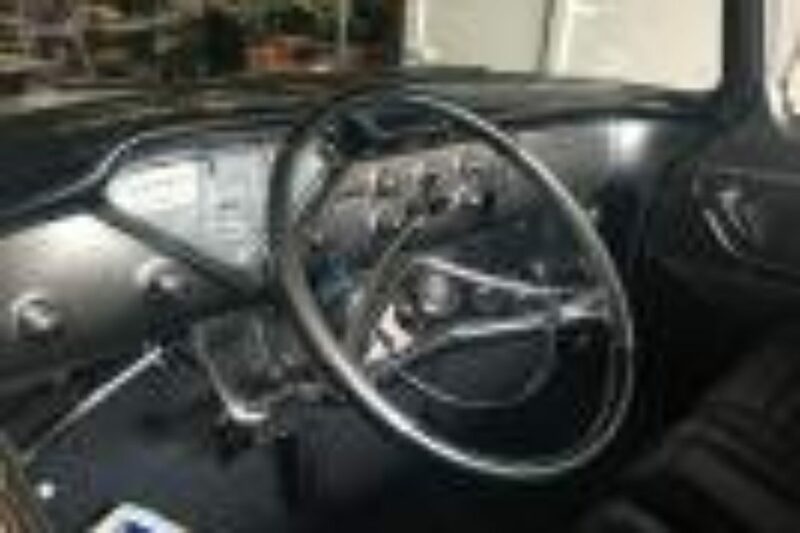 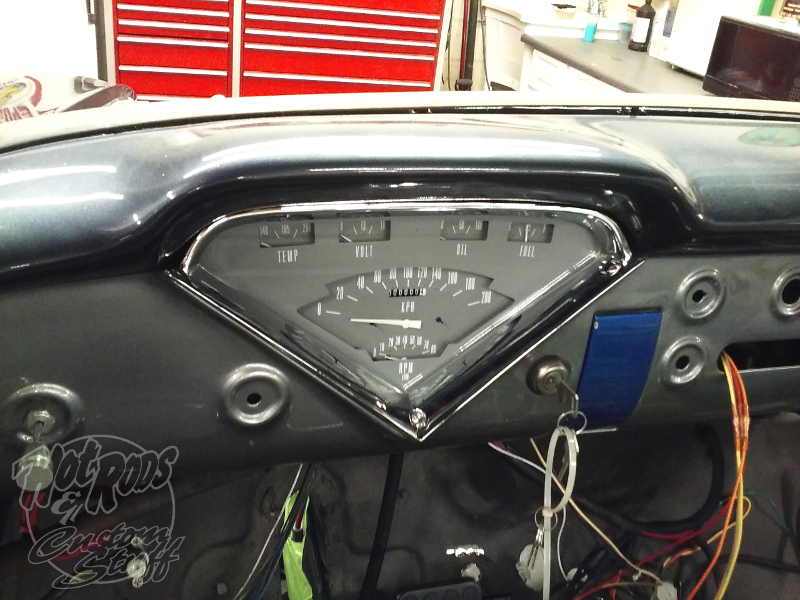 1959 Chevy Apache - Hot Rods & Custom Stuff Inc.
What’s better than a 1959 Chevy Big Window Fleetside? 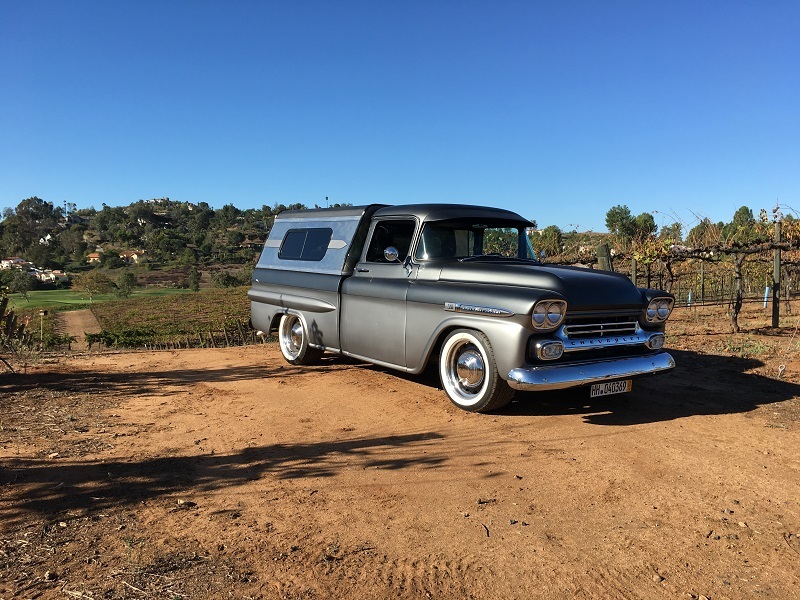 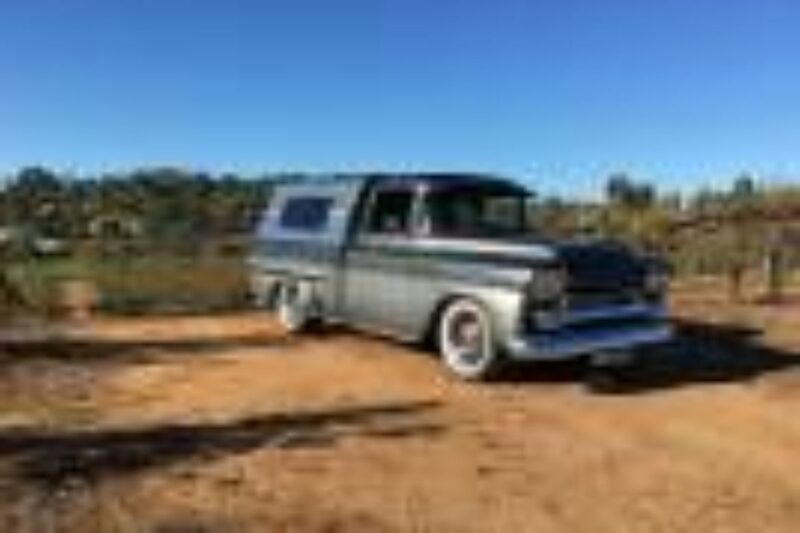 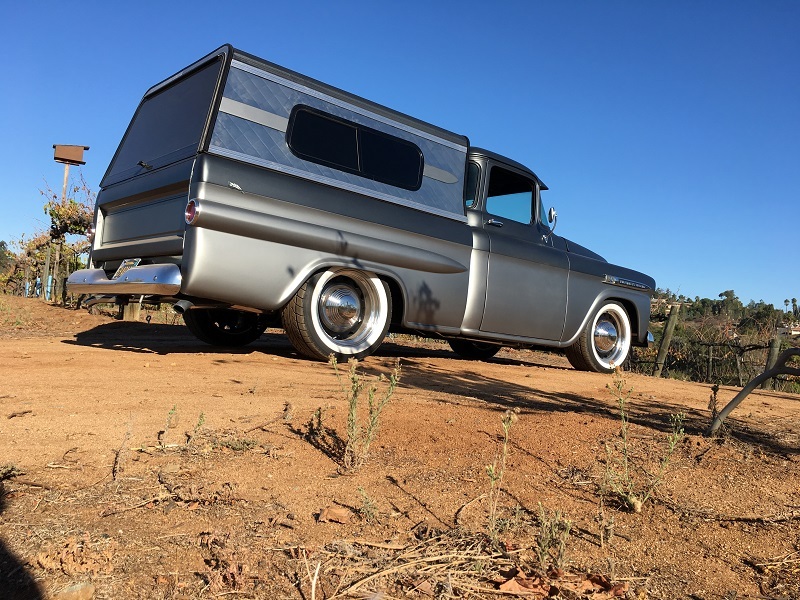 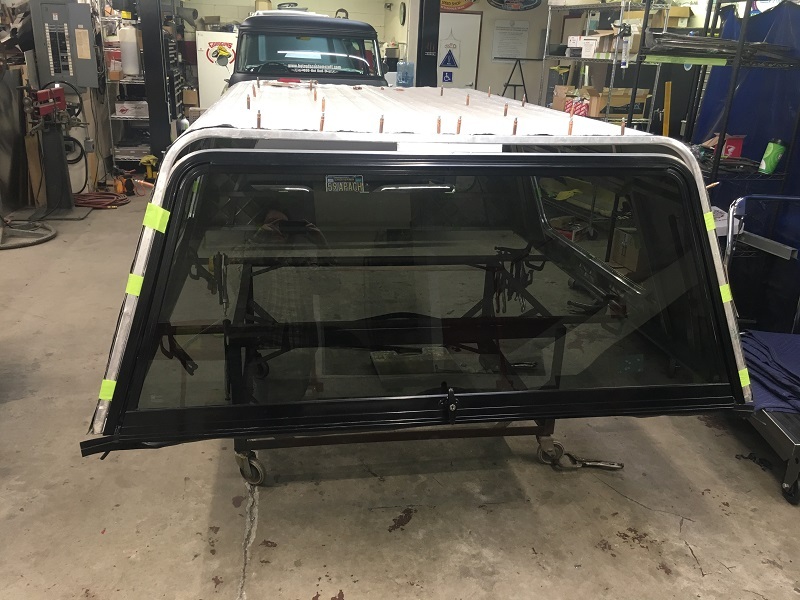 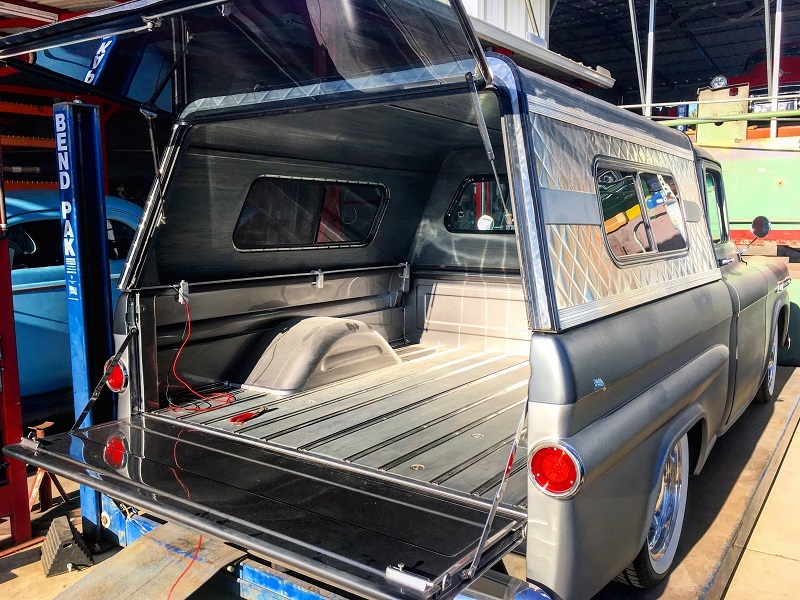 How about a 1959 Chevy Big Window Fleetside with a monster big block, custom hitch for towing, and custom camper shell for hauling? 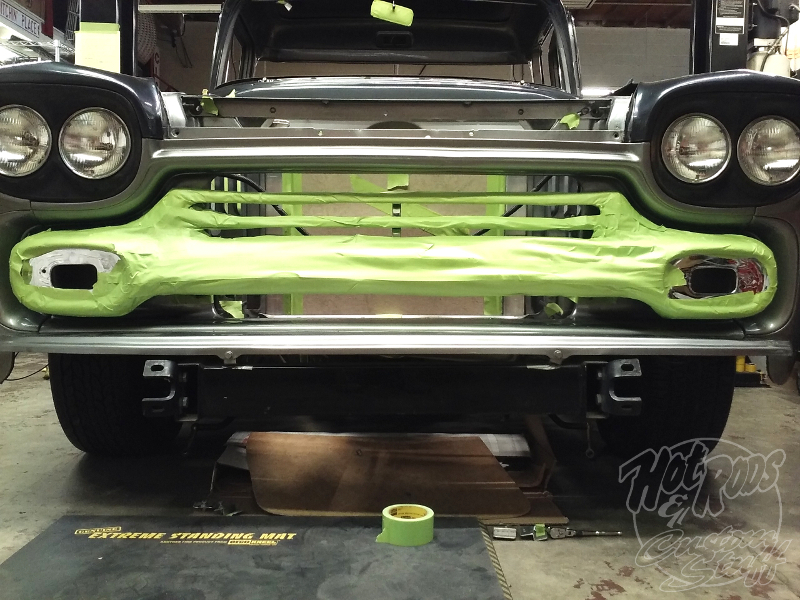 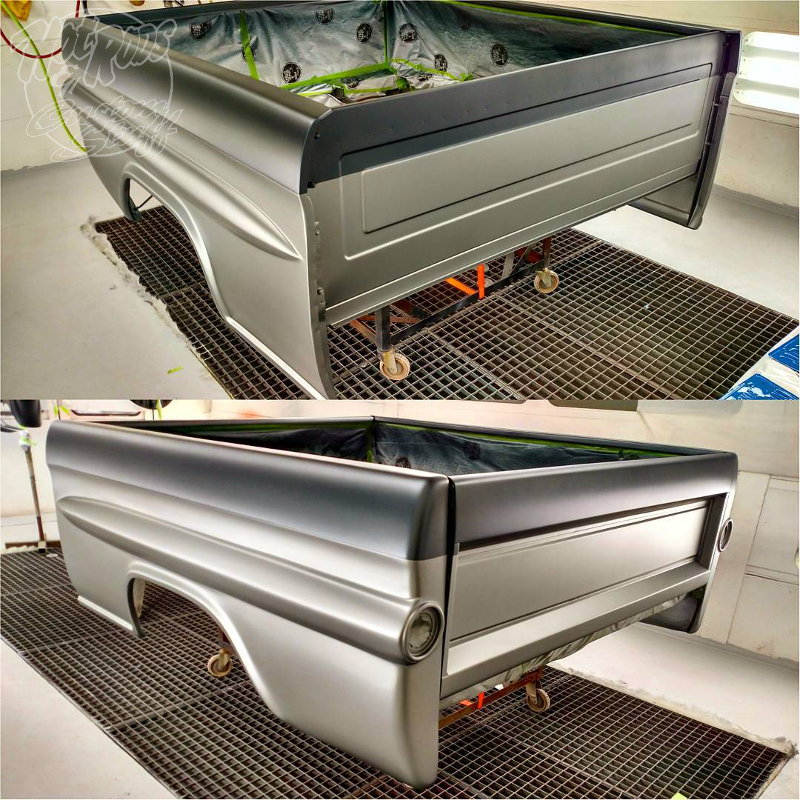 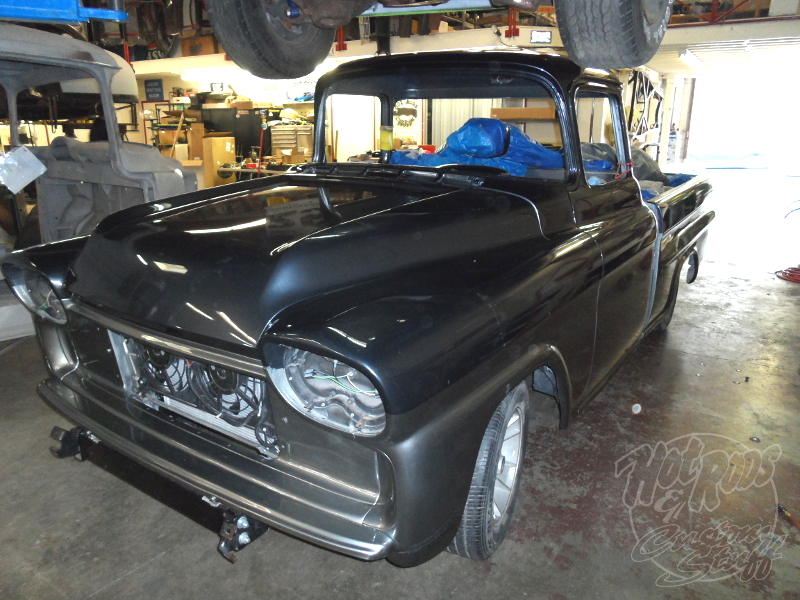 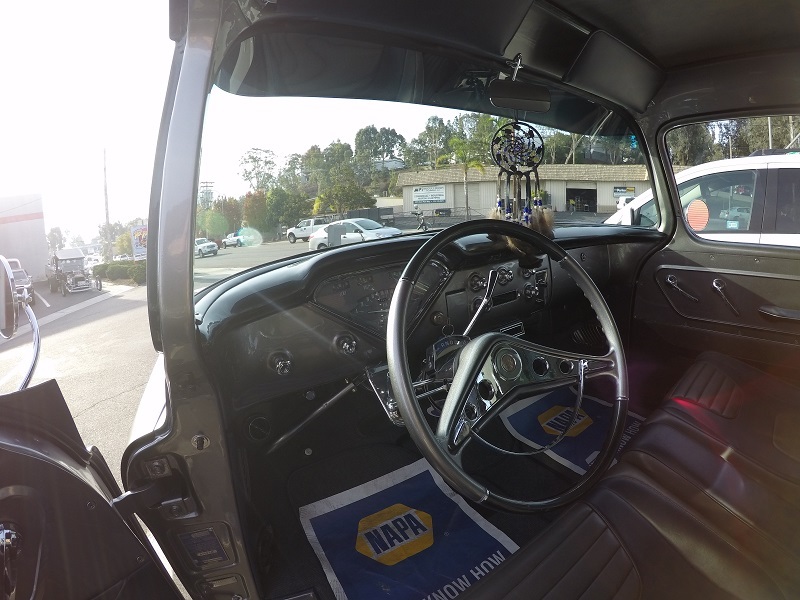 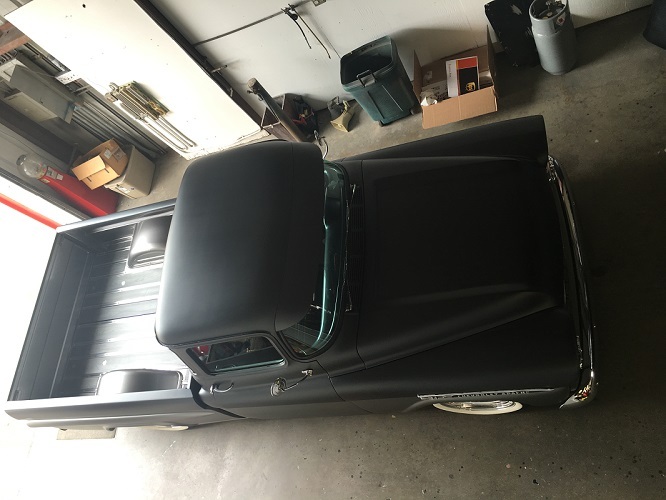 That’s exactly what we’re doing with this ’59 pickup. 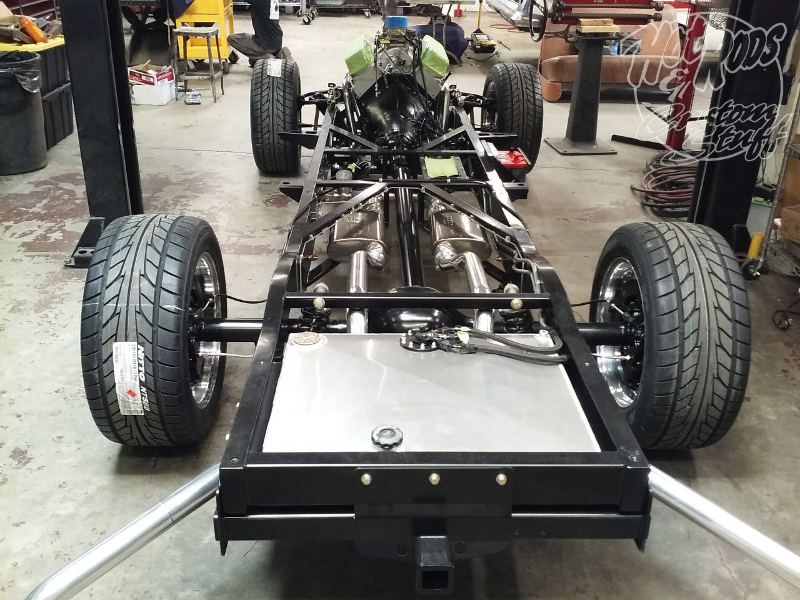 The foundation starts with a fully equipped TCI chassis, complete with Ridetech coilovers and a Currie rear end. 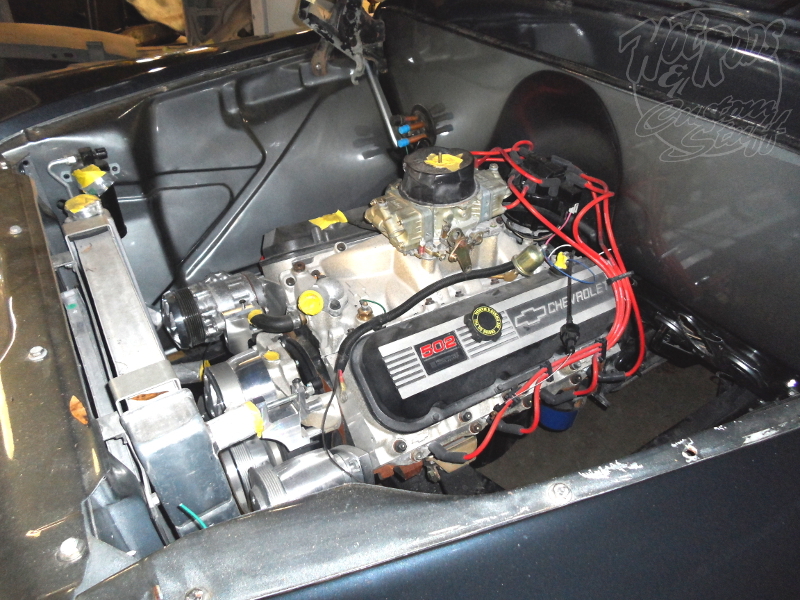 The power plant is a Chevy Performance crate 502ci with a built 700R4 automatic transmission behind it. 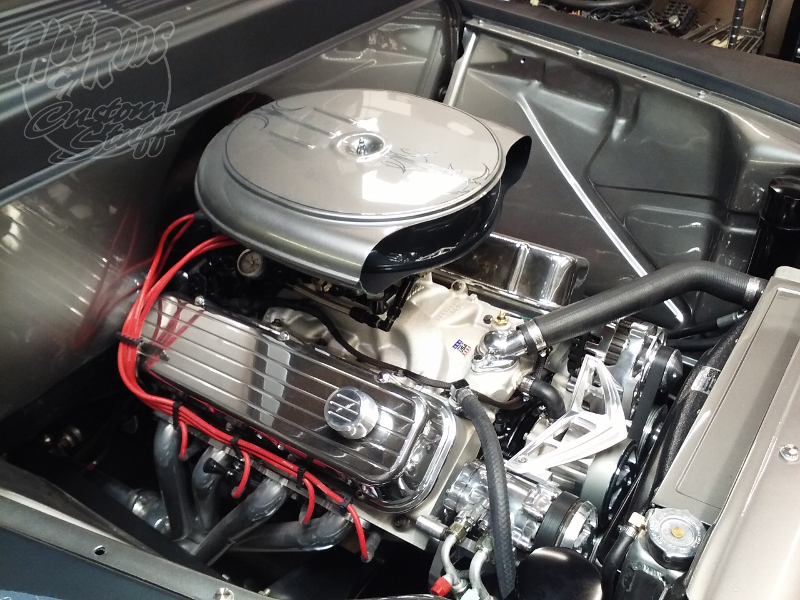 The big block is finished off with billet aluminum valve covers, a billet March Performance front drive serpentine kit, and a Holley carburetor. 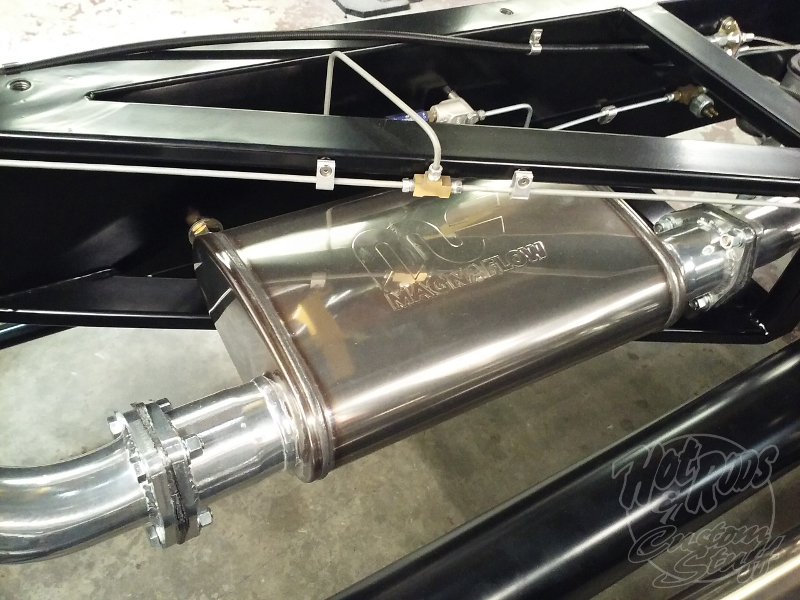 The exhaust starts with a set of long tube Sanderson Headers and flows back into a ceramic coated custom exhaust with Magnaflow mufflers. 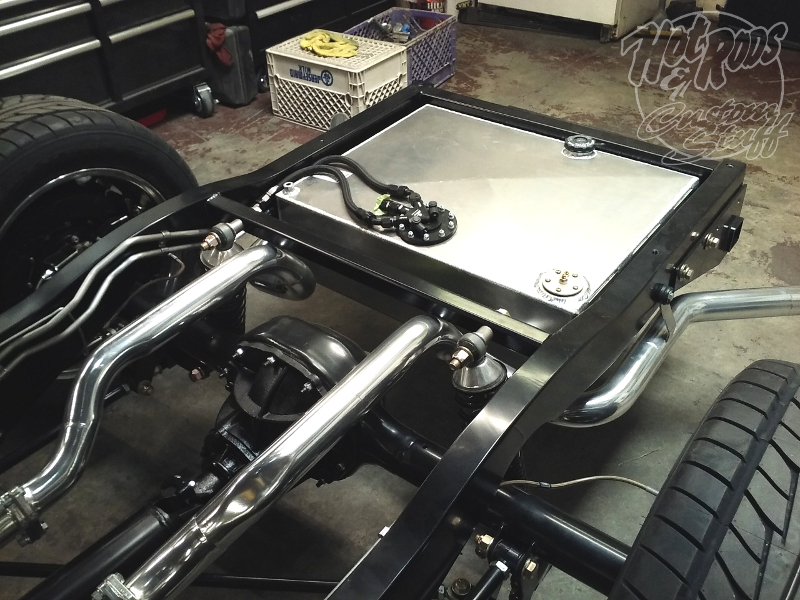 Fuel is delivered from a No Limit Engineering aluminum gas tank by an Aeromotive Phantom in-tank pump. 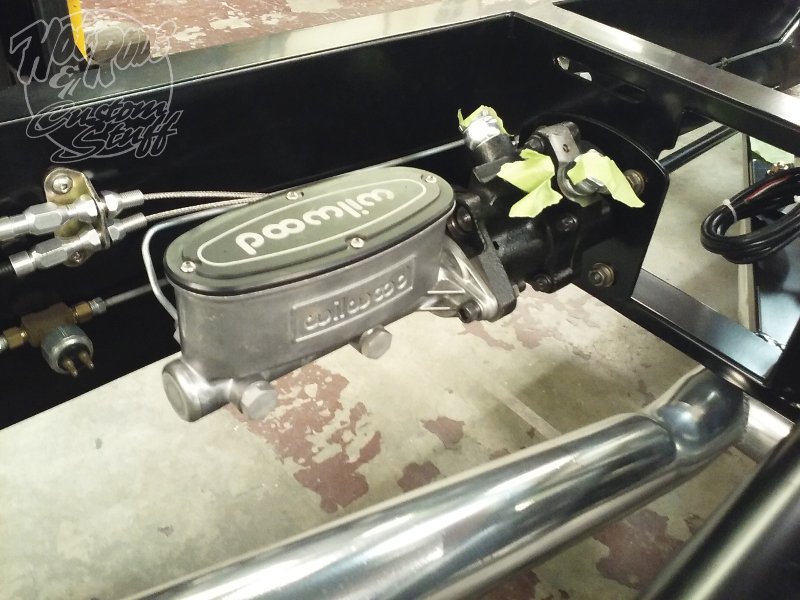 To slow everything down, the ’59 Chevy has 14″ Wilwood disc brakes, a Hyrdatech hydroboost unit, and a Wilwood tandem master cylinder. 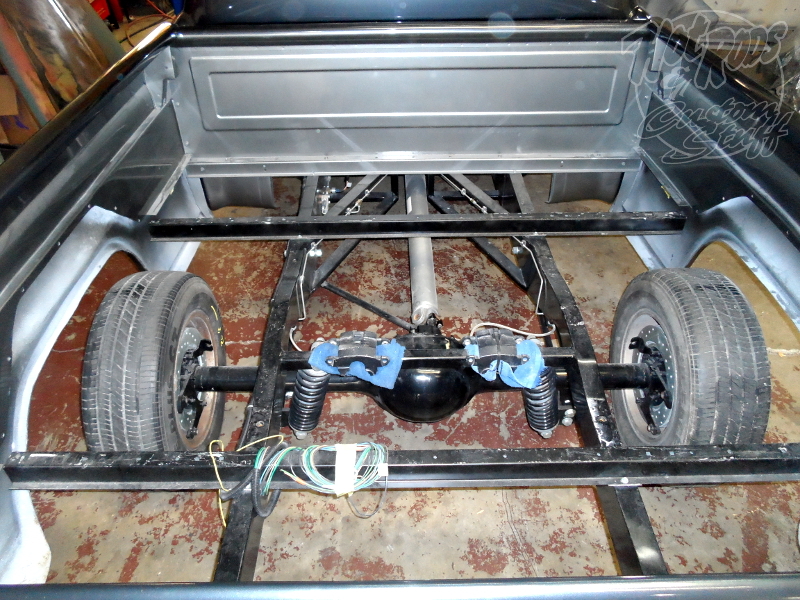 Out back the chassis was fitted with a custom fabricated hitch for towing a trailer full of toys. 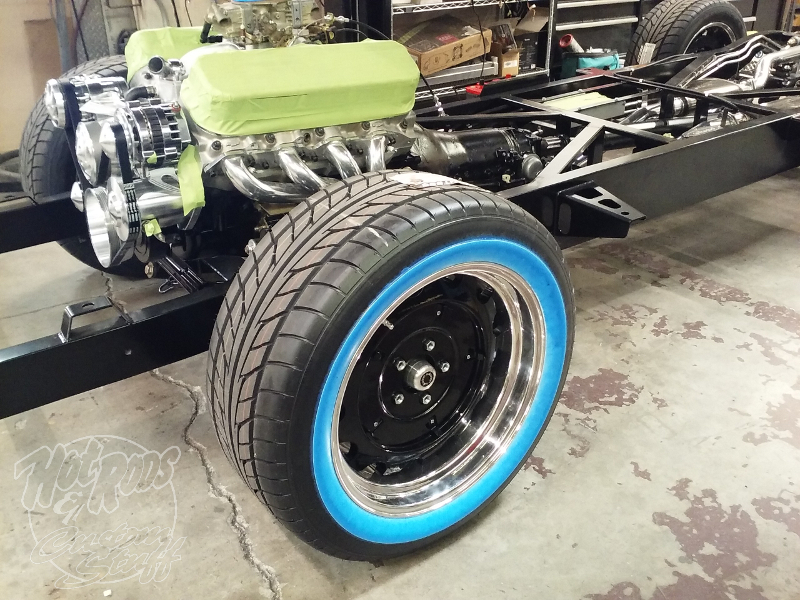 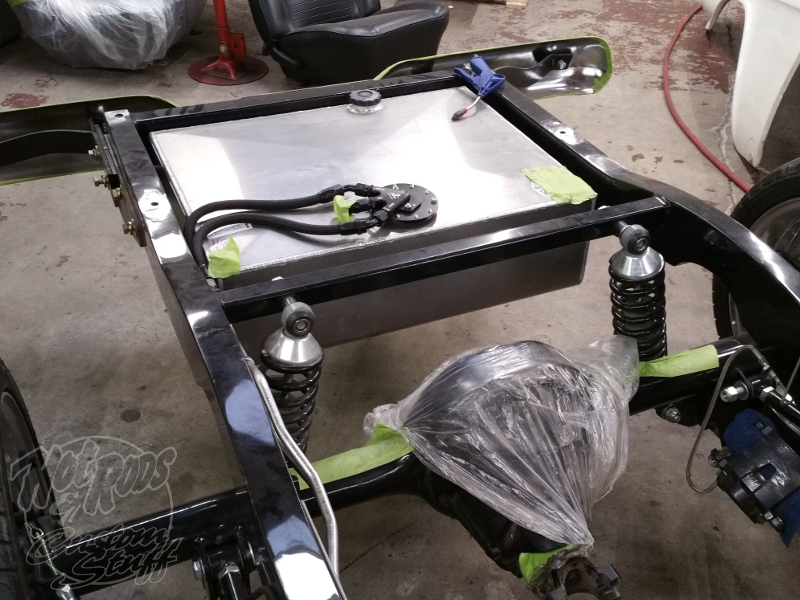 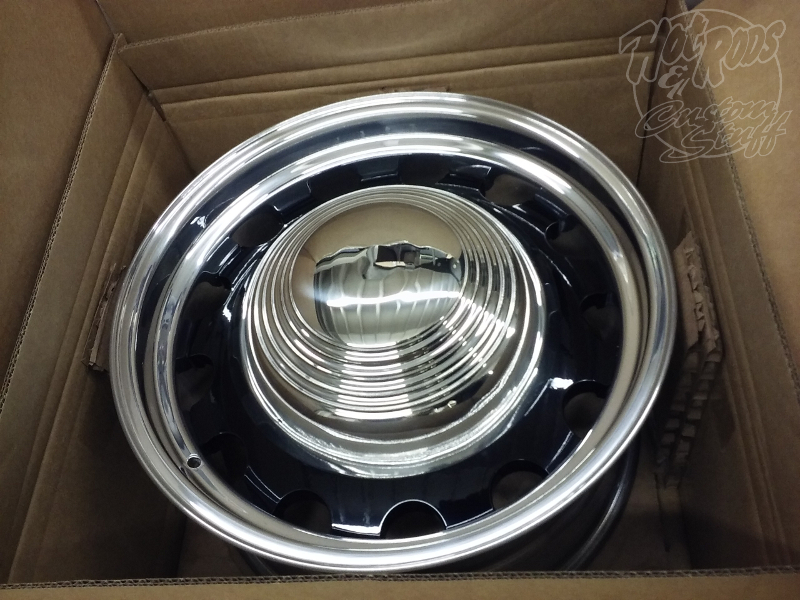 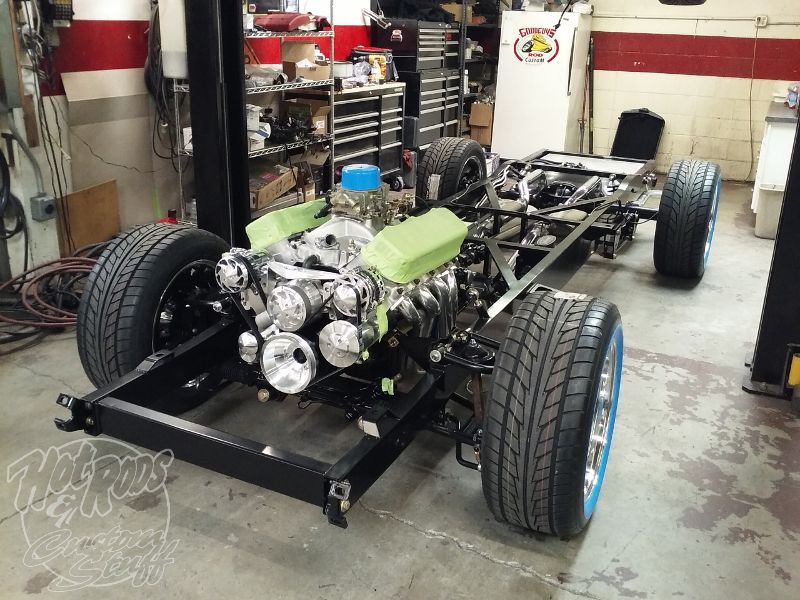 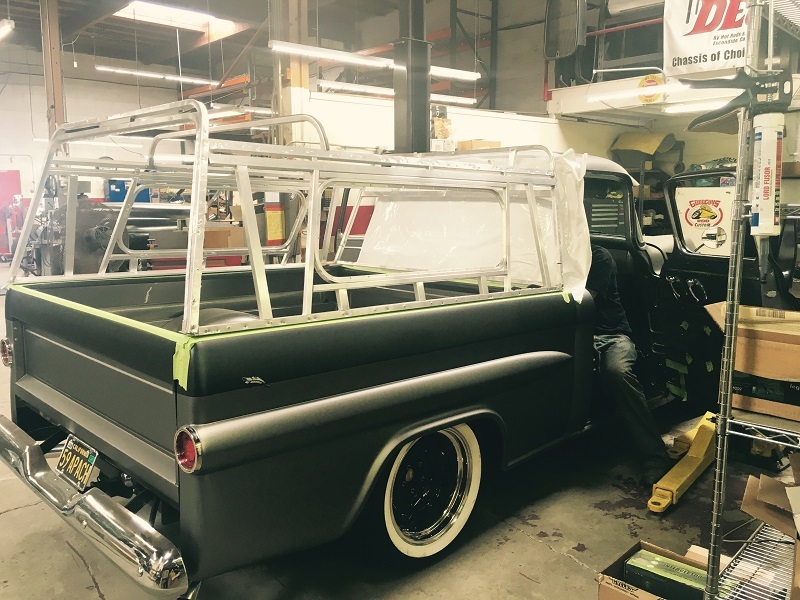 Finishing the chassis off are a set of 18″ Circle Racing aluminum artillery style wheels wrapped in Nitto white wall tires (Front – 265/50R18 Rear – 295/45R18). 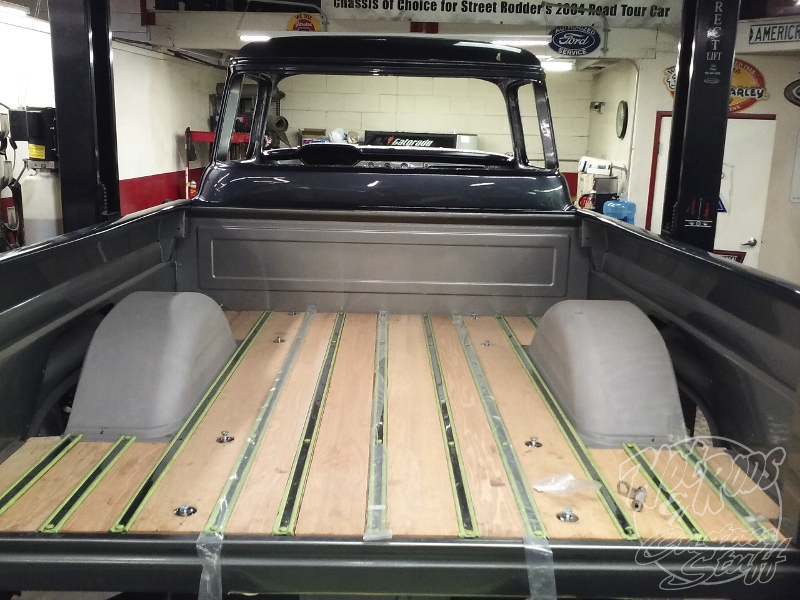 The chassis isn’t the only thing on this truck well equipped. 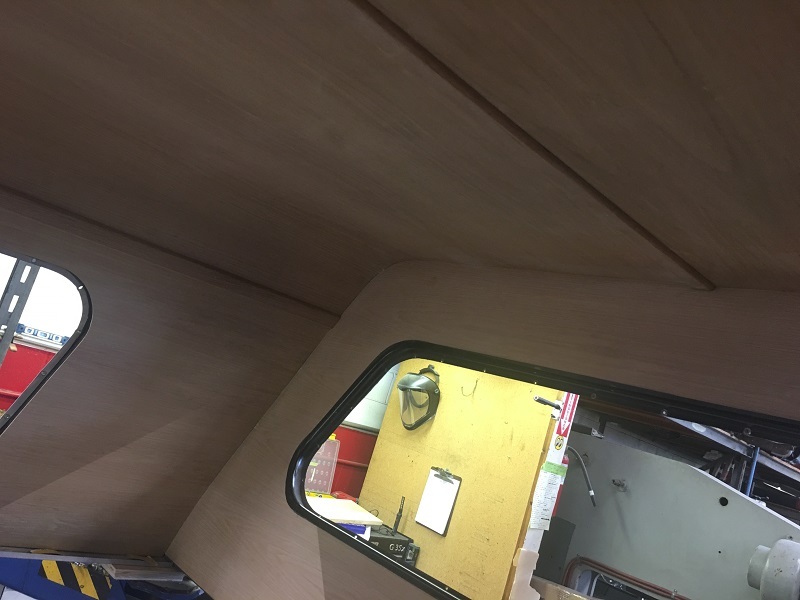 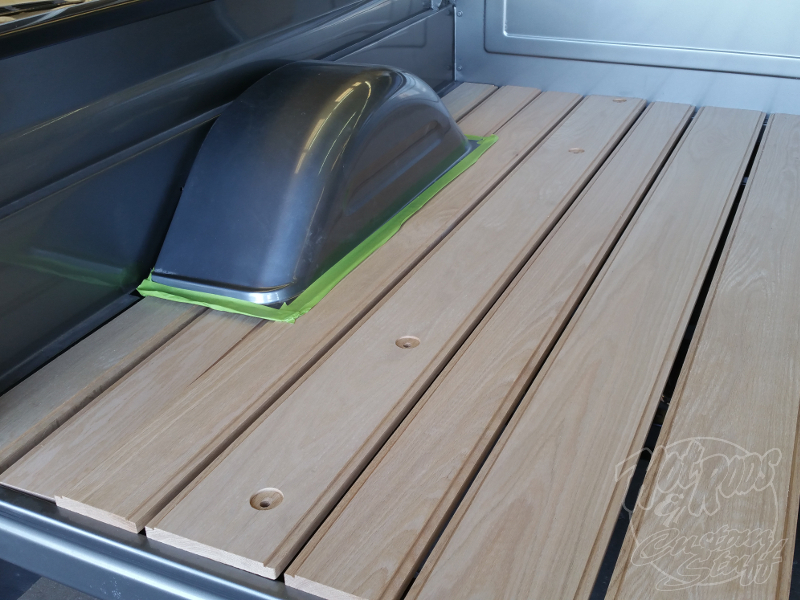 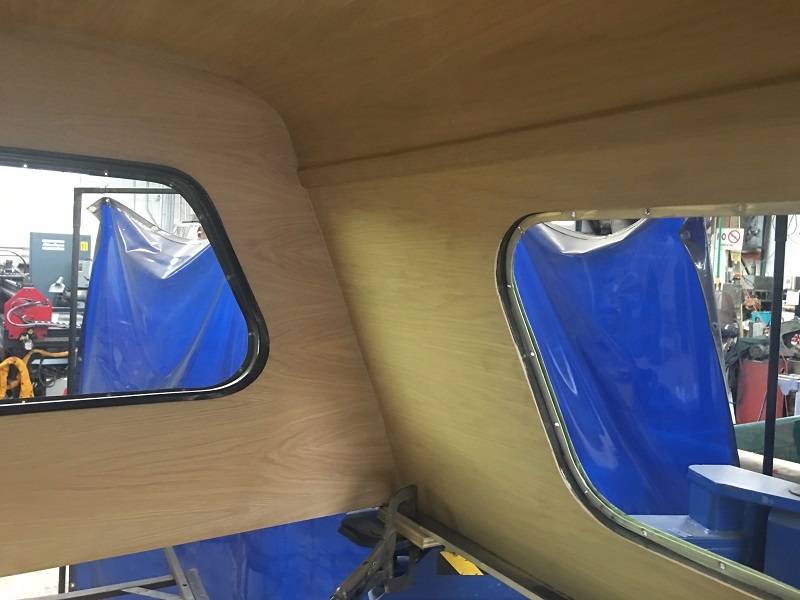 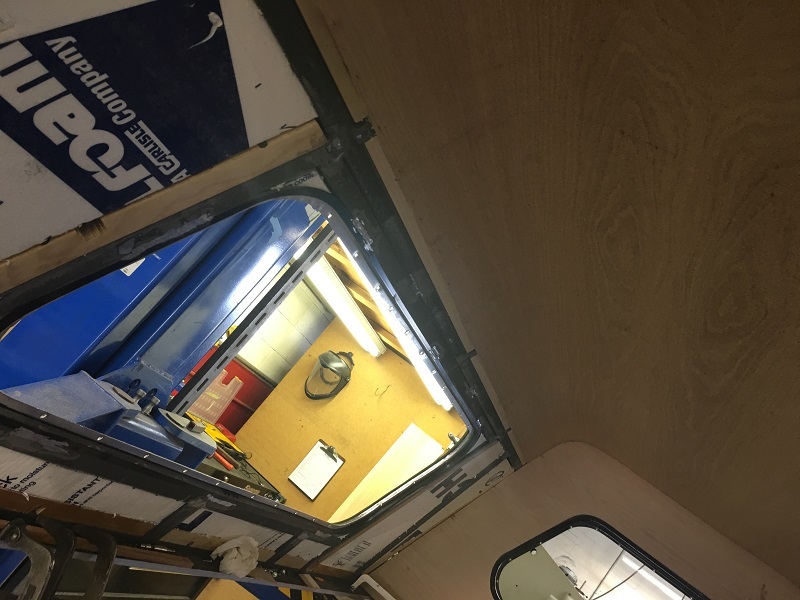 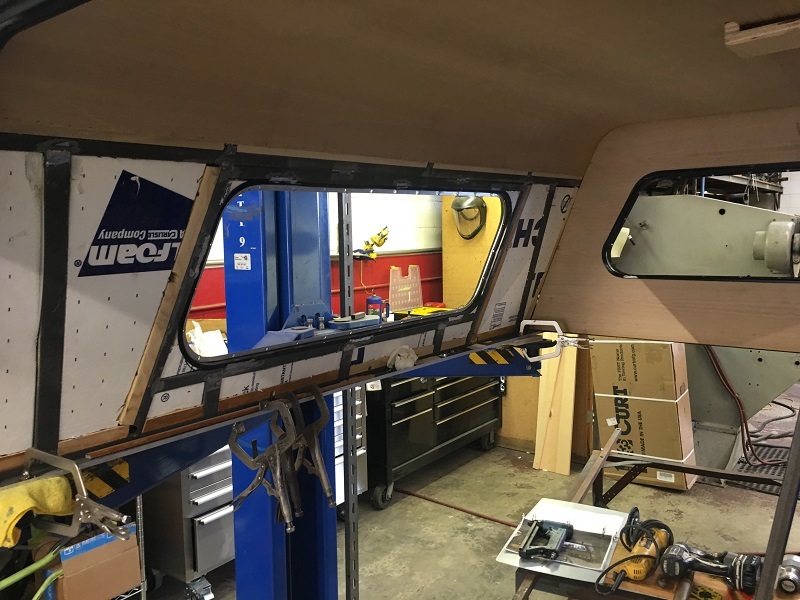 Out back, the oak bed is fitted with a Legen’s hidden hinge kit that tilts one of the bed planks up for access to the fuel tank. 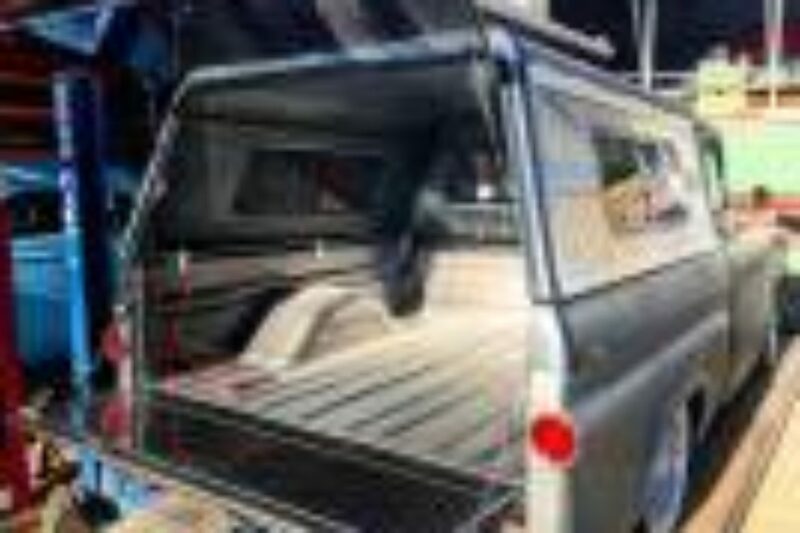 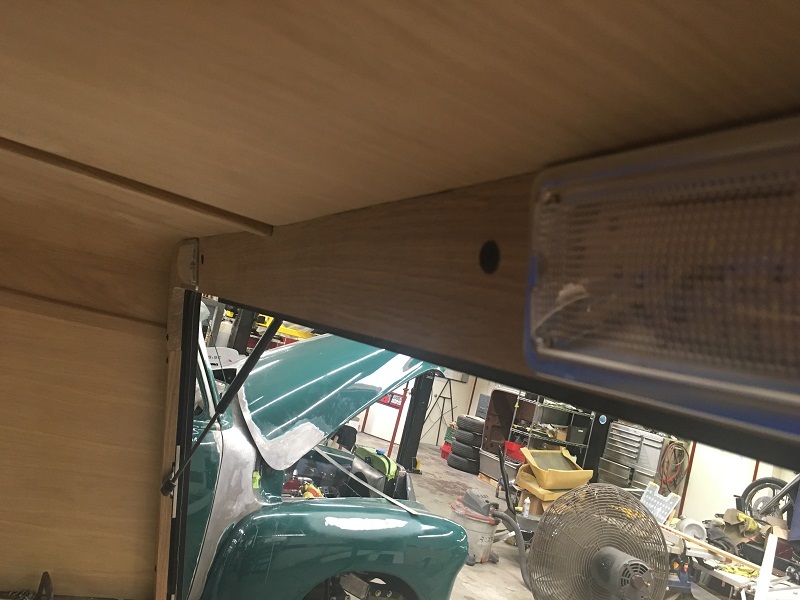 The tailgate has Mar-K hidden links and custom latches. 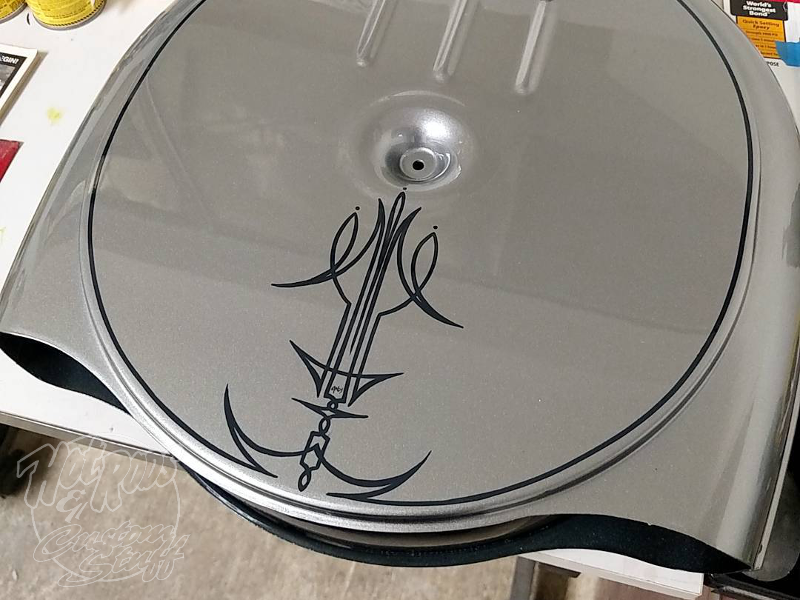 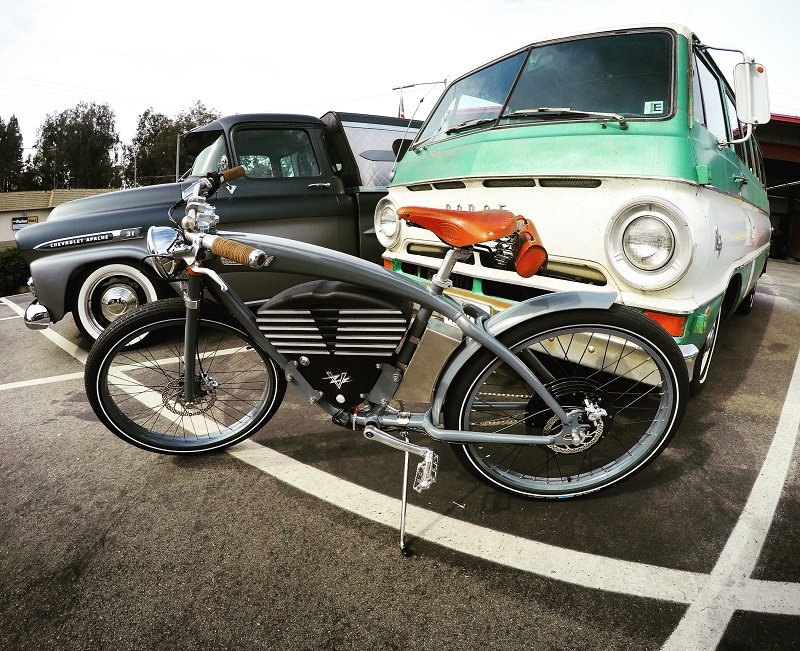 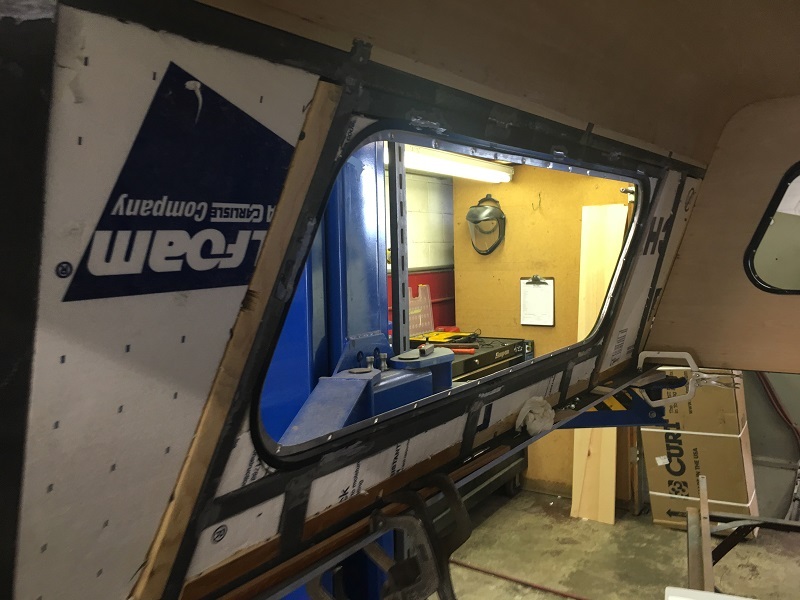 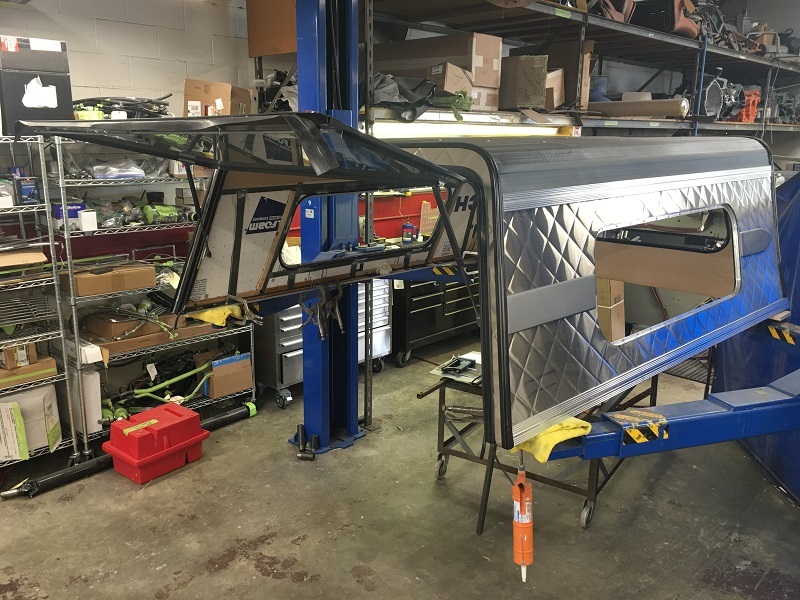 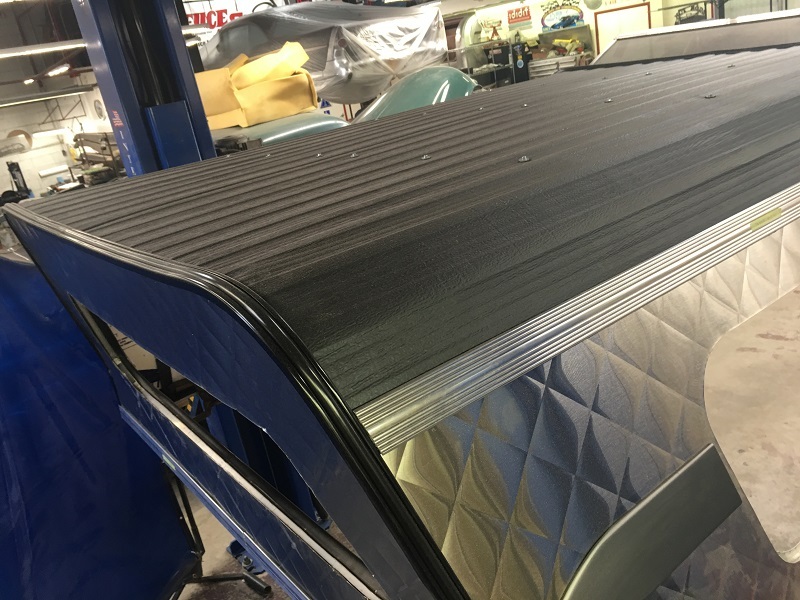 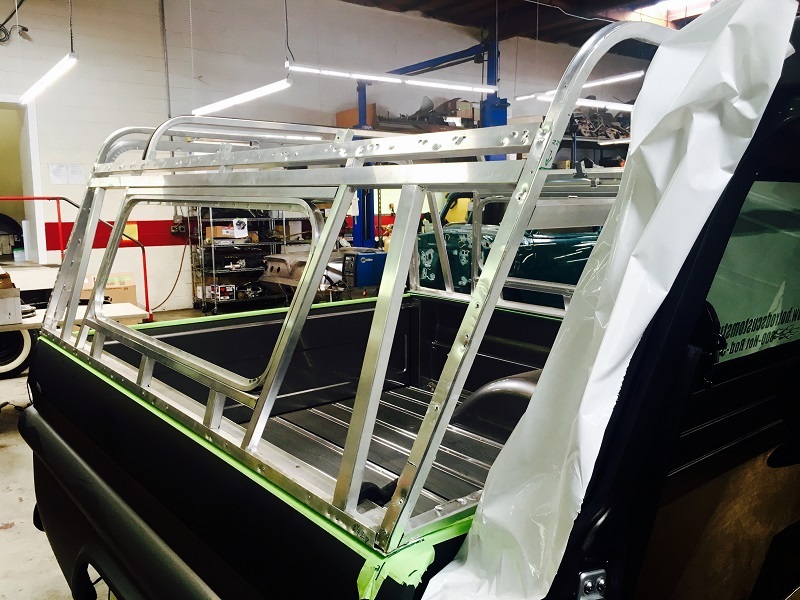 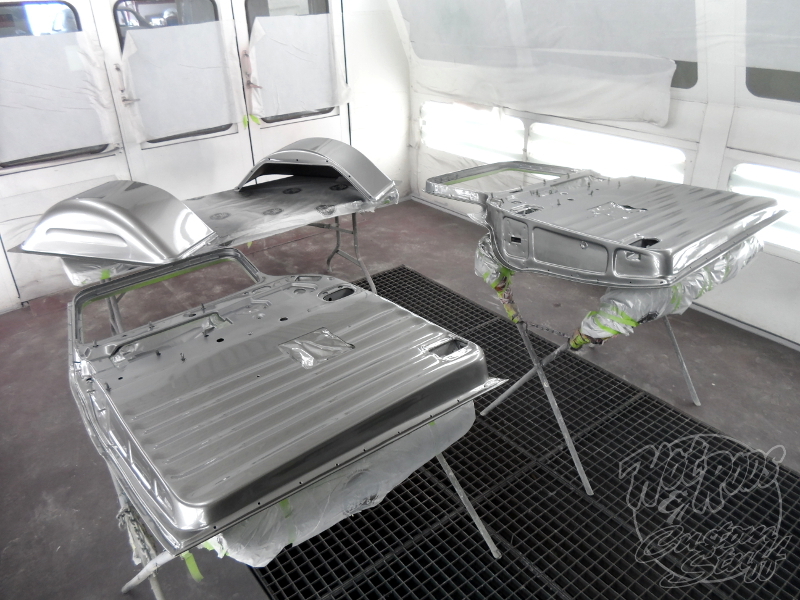 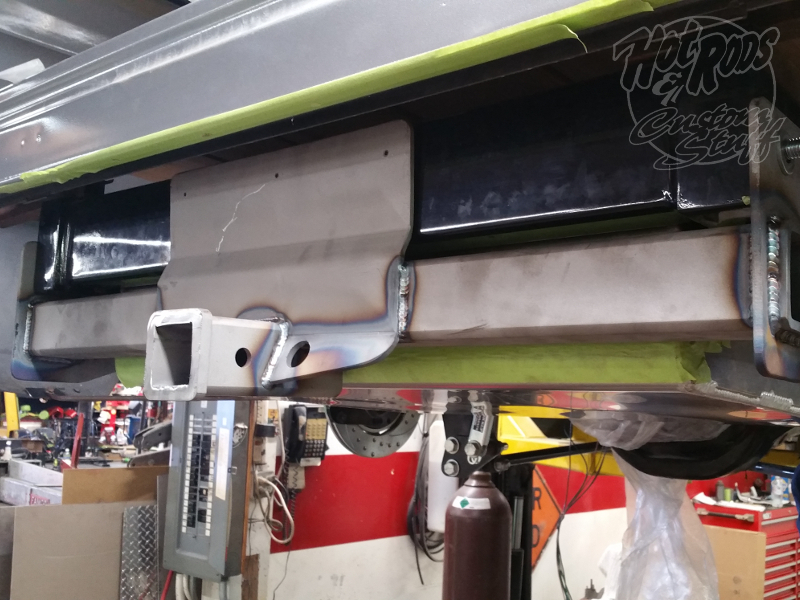 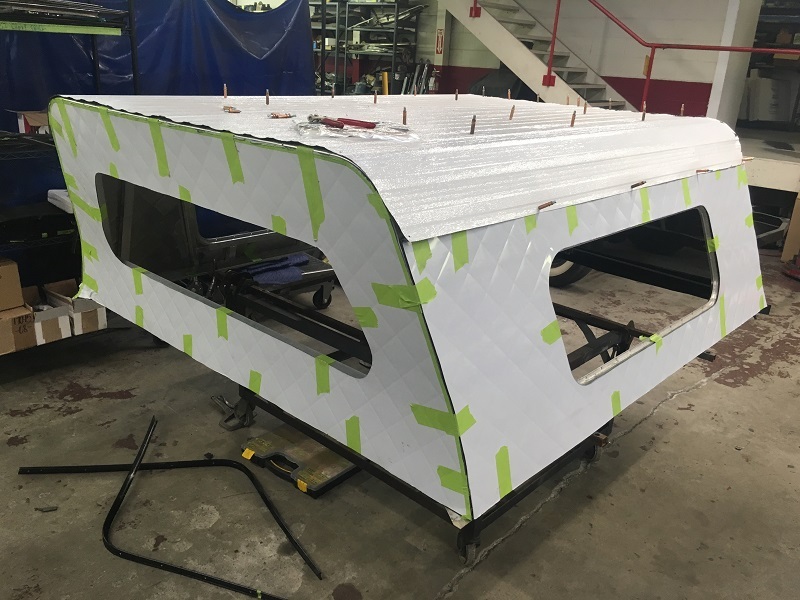 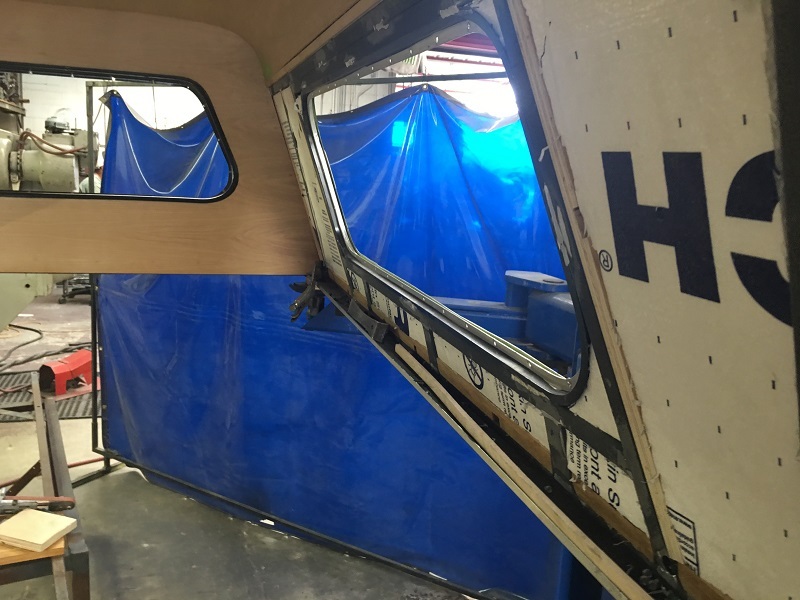 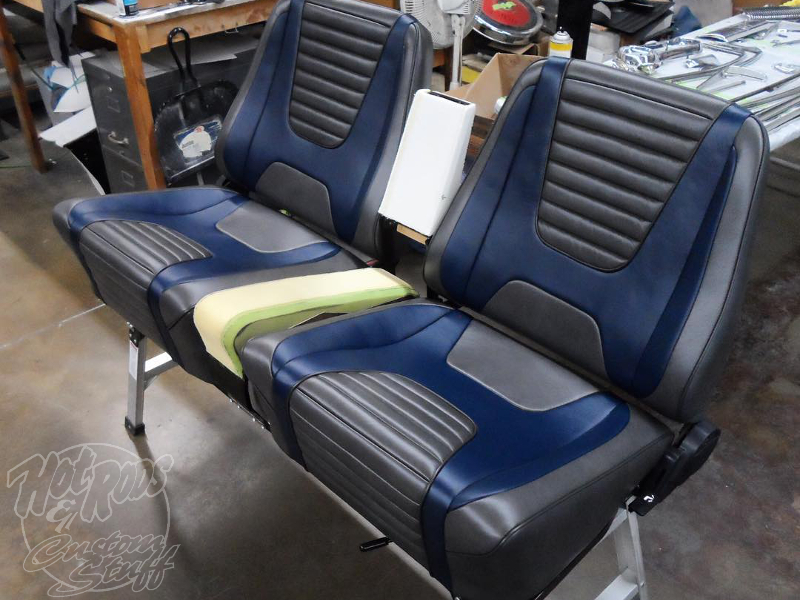 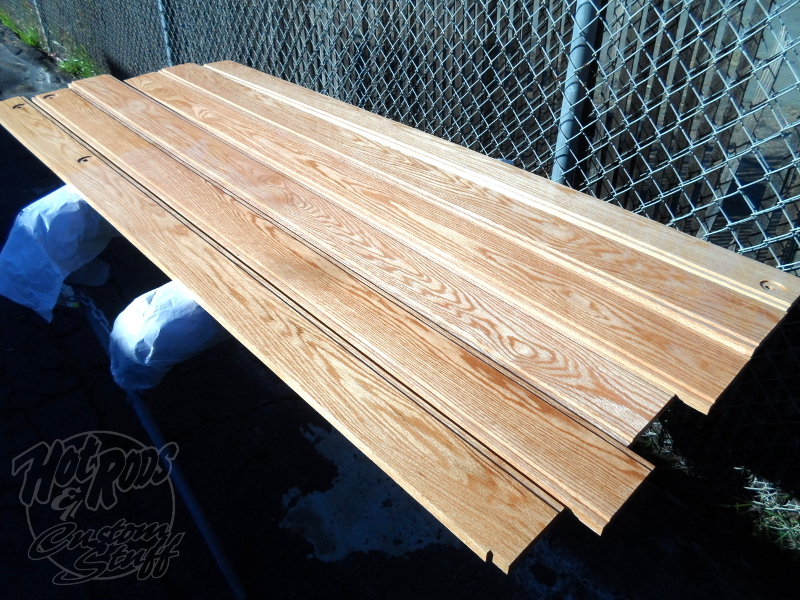 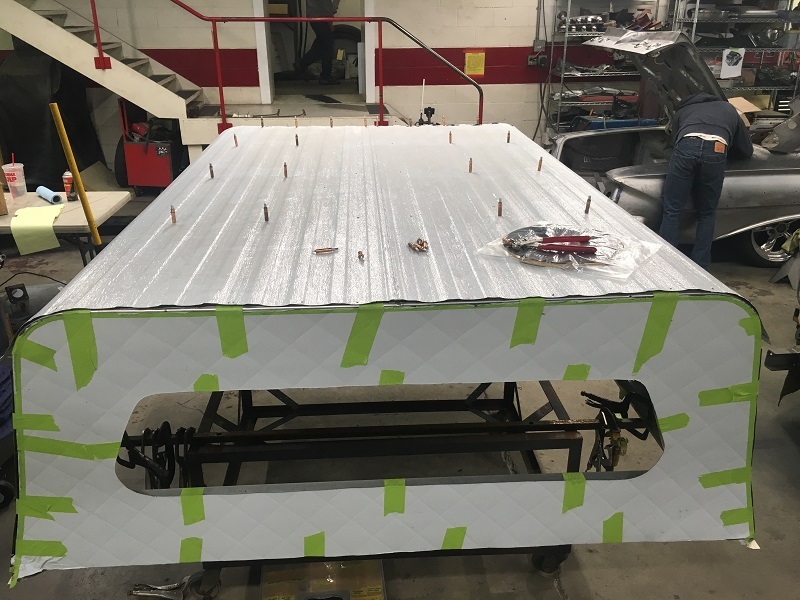 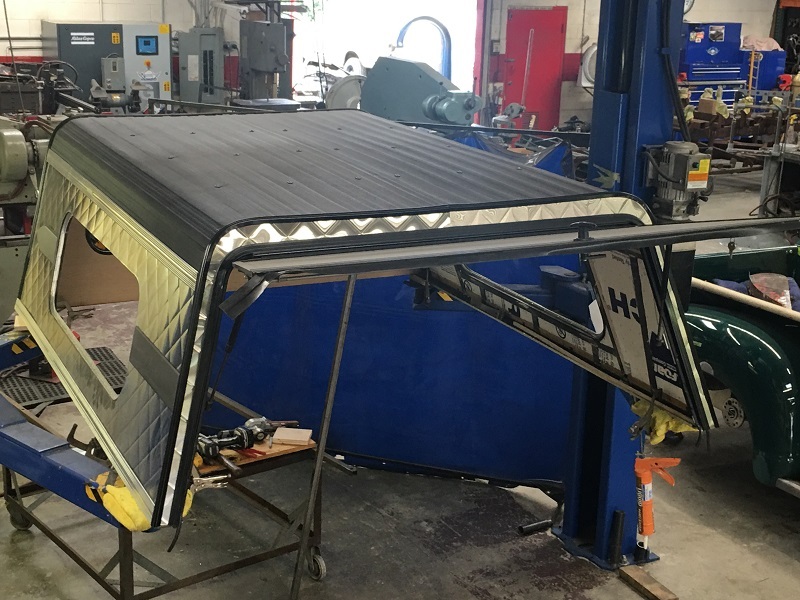 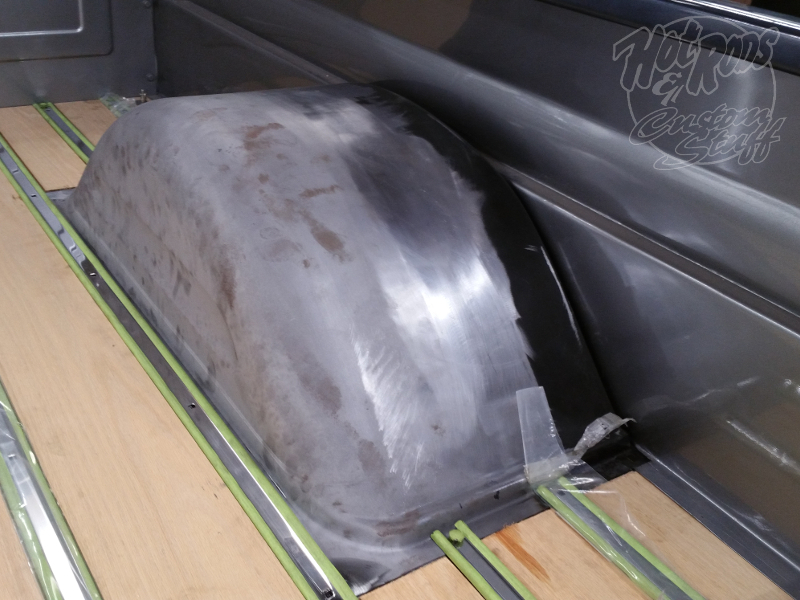 All of that will be tucked under the custom camper shell built to the customer’s specs. 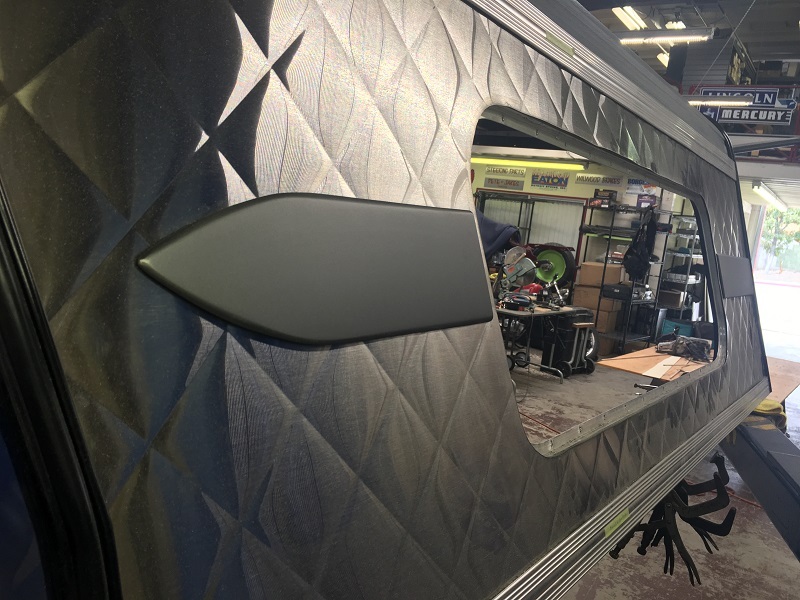 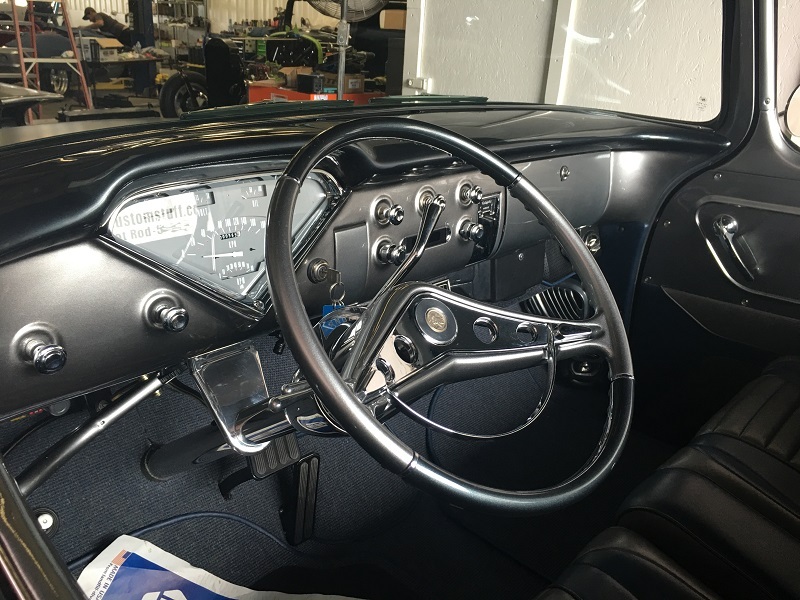 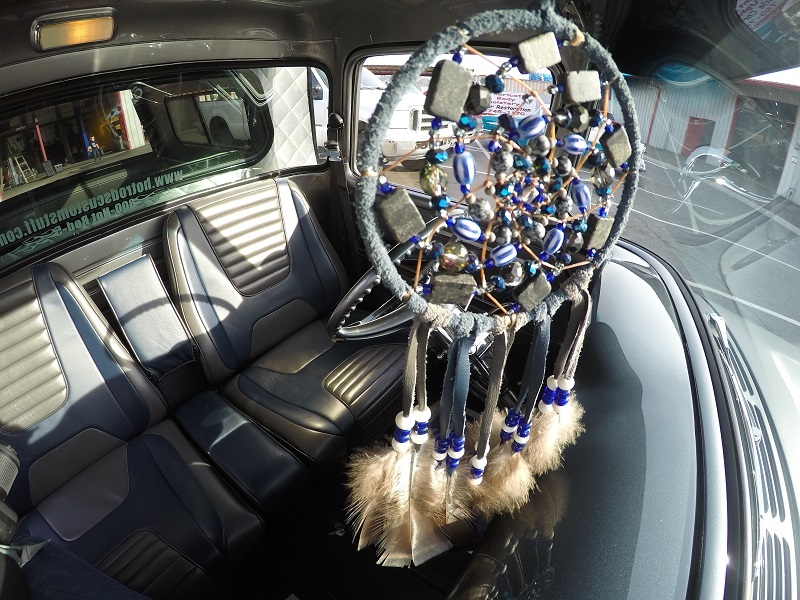 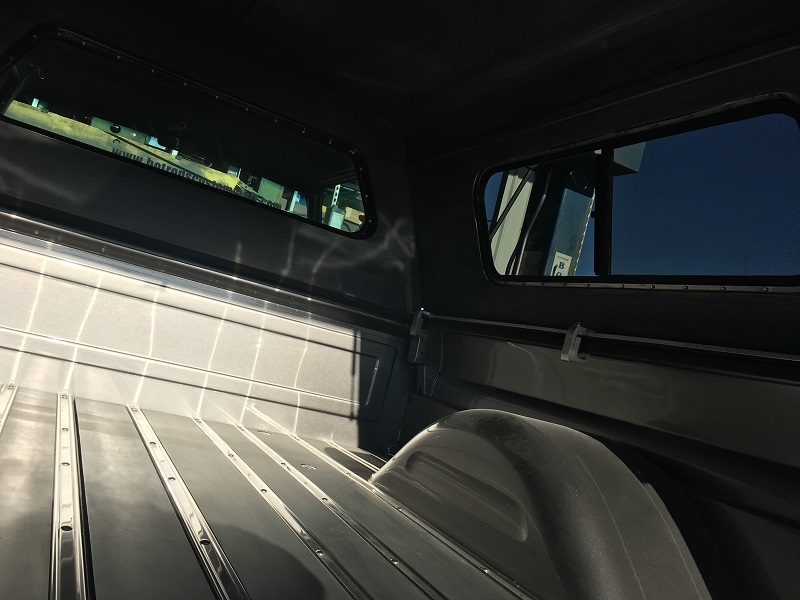 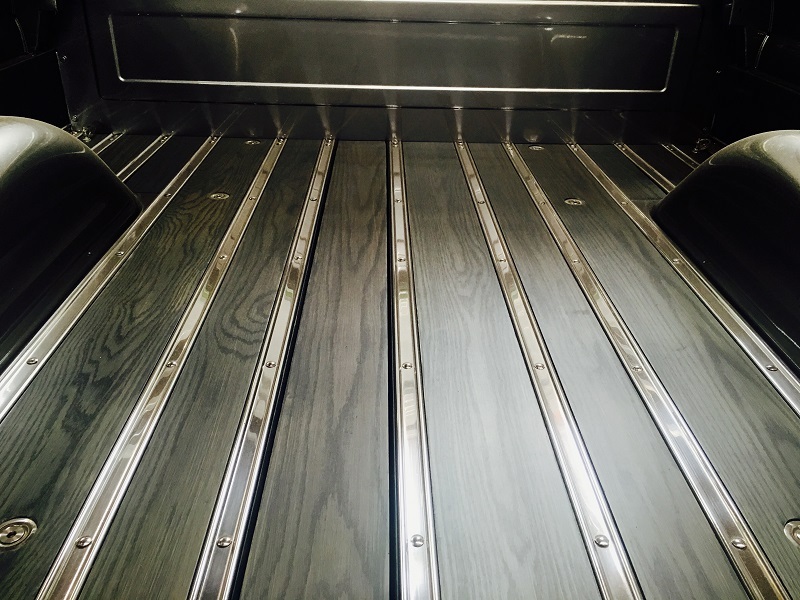 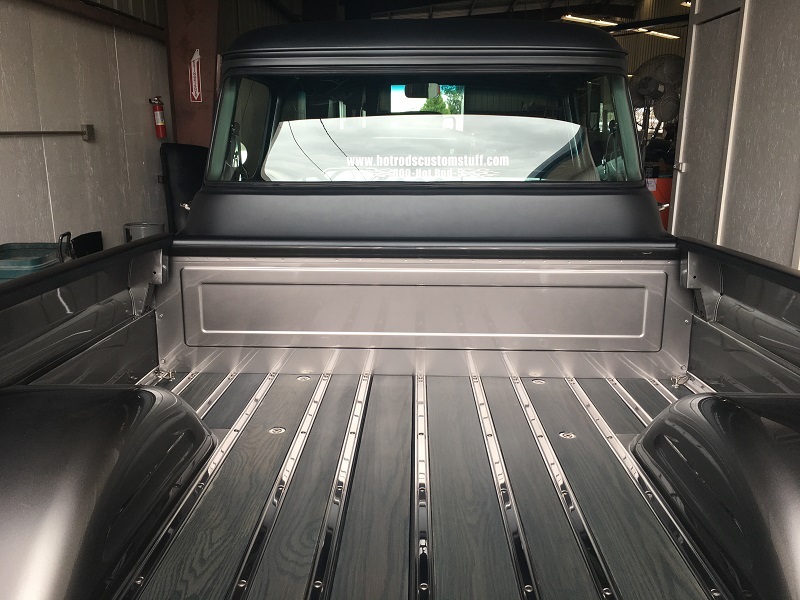 The cab of the truck features Classic Instruments gauge cluster, Glide Engineering bench seat, a Flaming River polished stainless steel column, an impressive sound system, 1-piece power windows, electric wipers, and custom leather upholstery done in house here at HR&CS. 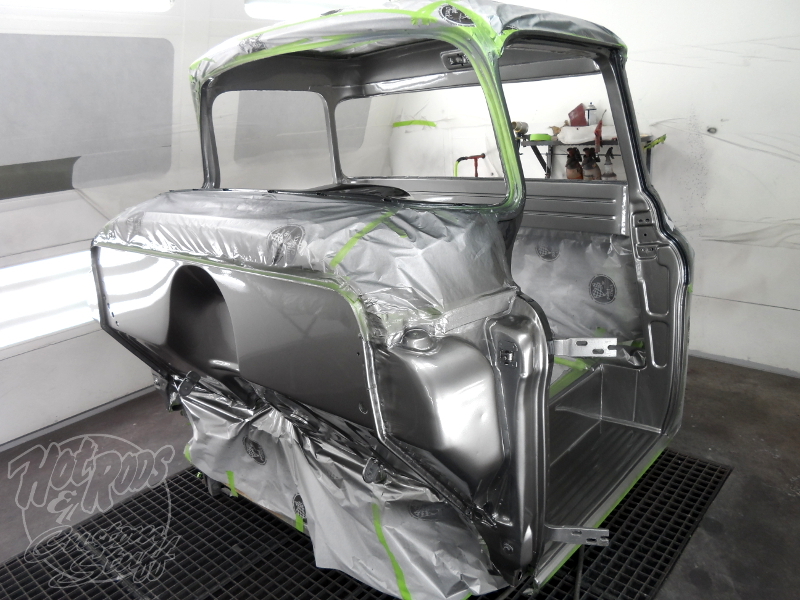 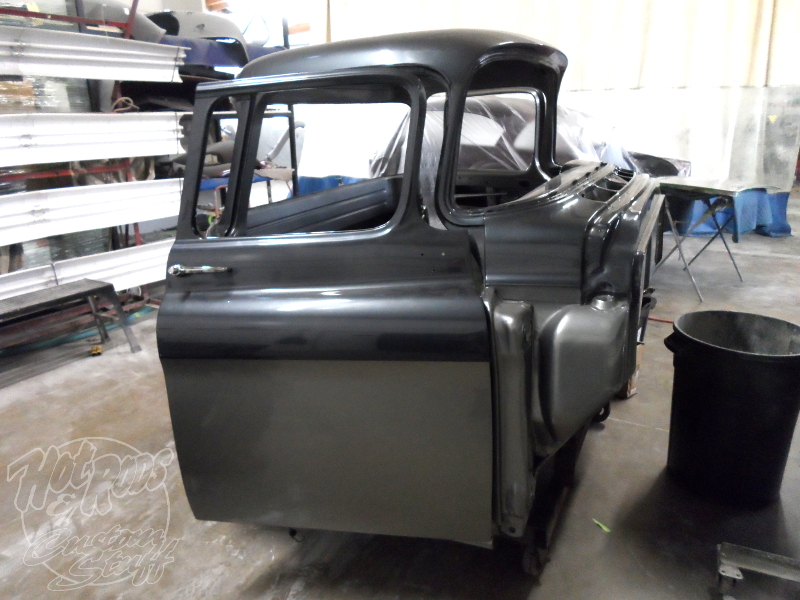 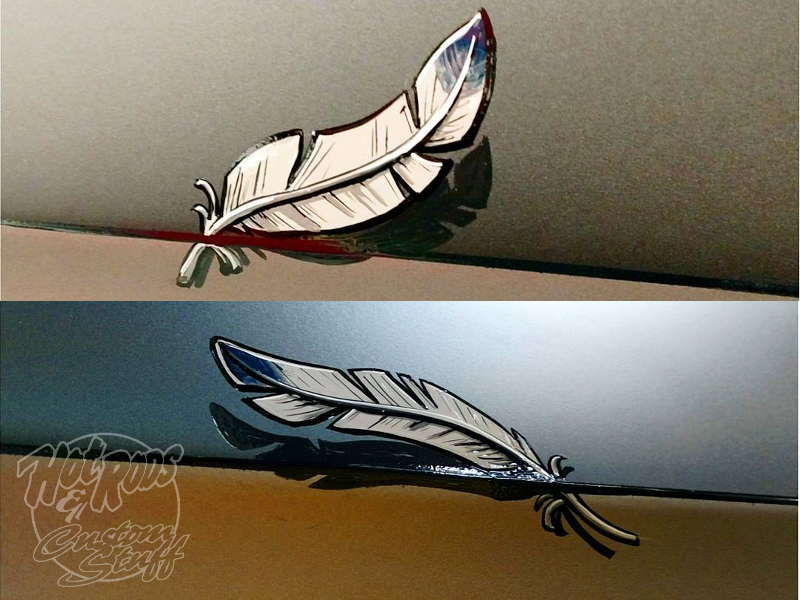 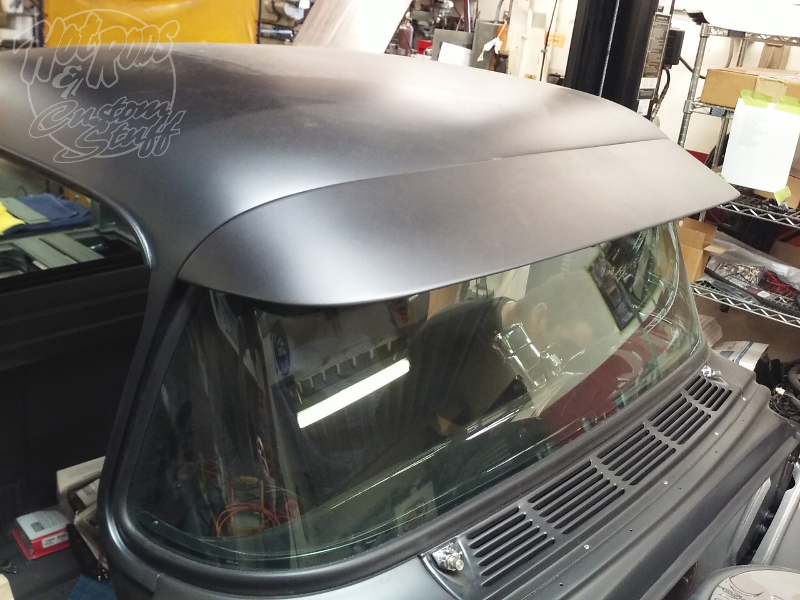 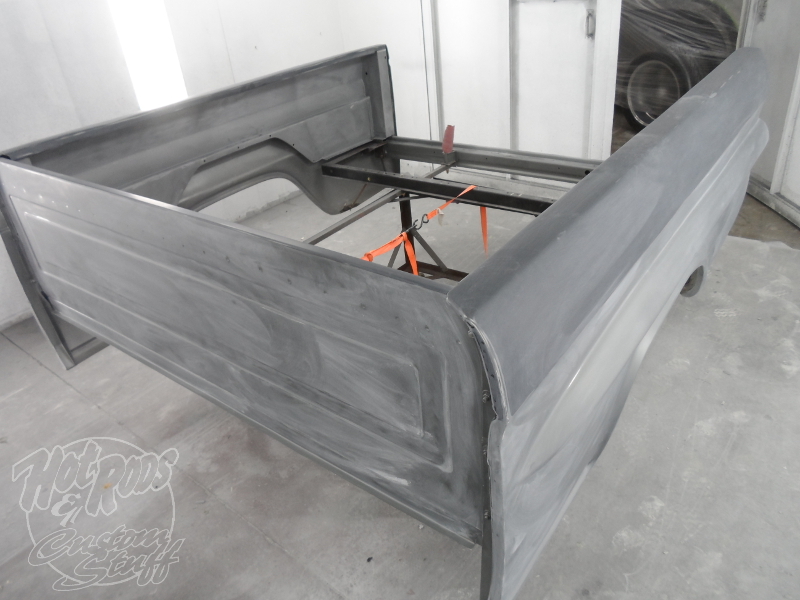 The body was finished off with a beautiful two tone paint job and PPG flat clear.